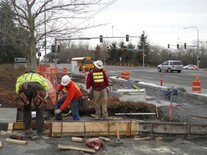 A traffic light pole foundation is prepared for concrete on 75th St. The early stages of traffic light installation has begun on 75th Street SW. Current light poles need to be replaced by stronger ones — particularly along the north side of 75th, where the horizontal arms will need to stretch over three lanes of traffic. 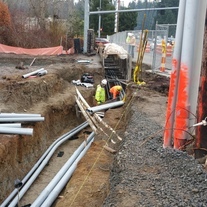 Crews are currently pouring concrete foundations for the new poles and plan to install the actual poles in a few weeks. To facilitate the traffic pole installation, 75th St. will continue to be narrowed to one lane in each direction when needed between 7:30 a.m. and 5 p.m.
At the site of the future Seaway Transit Center, conduits for electricity, water and communications lines are being placed wherever they will be needed to service buildings, bus stops and the Swift Green Line terminal stations. Crews do not anticipate a need to close any lanes on Seaway Blvd. for at least two weeks. Construction on Swift Green Line stations continues in stages, as planned. Area 1 stations (along Airport Rd. north of Hwy. 99) will experience periodic nighttime (8 p.m. to 4 a.m.) and daytime (9 a.m. to 2 p.m.) lane closures for the next several weeks as crews continue underground utility work and pouring concrete curbs, gutters, sidewalks and foundations. In preparation for work in Area 2, Community Transit will close the bus stop on westbound 128th St. SW at 4th Ave W (stop #1553) on Jan. 11. Riders on Route 101 or Route 105 will need to catch their bus either at the Mariner Park and Ride or on westbound 128th St. at 8th Ave W (stop #1554). The Swift Green Line station construction is divided into geographical areas and stages of work. See page 2 for a map of the areas and descriptions of the stages. Information about the stations for Swift Green Line is online at www.communitytransit.org/swiftstations. On the night of Jan. 8, eastbound lanes of 128th St. will be closed just before the I-5 overpass while construction workers install a guardrail along the bus merge lane. One lane will close at 8 p.m. and a second lane will close at 9 p.m. Traffic control officers will be on site. 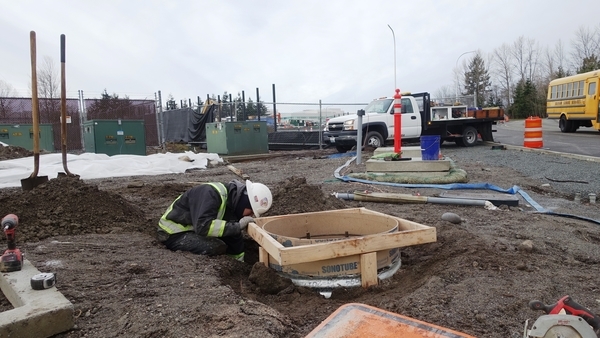 The work is expected to be completed well before 5 a.m.
On the night of Jan. 9, adjustments will be made to the traffic signal at the southbound I-5 on ramp. Expect brief signal shutdowns and possible closures of eastbound lanes. The new eastbound lane is expected to open in mid-January. Construction continue the preliminary work of adding a westbound lane that will be used for cars getting onto northbound I-5 and buses continuing on 128th St.
Utility conduits are being placed underground where the new sidewalk will be, on the north side of 128th St. just west of 3rd Ave.
After the conduits are in place, concrete will be poured and cured, the trench filled in and the rain garden completed. This work should conclude in January. Get your questions about the Swift Green Line and its construction projects answered in real time by joining Community Transit staff for a live webcast. Join the 30-minute webcast at 6 p.m. on Tuesday, Jan. 16. Visit www.communitytransit.org/CTLive for details. All webcasts are recorded and available for online viewing within 24 hours. The Swift Green Line will serve 34 stations at 16 intersections and two terminals. Community Transit is building the stations in stages: underground utility work, concrete platforms, and finally the station structures. Stage 1 began in Area 1, the northernmost part of the route, and will generally move east and south. Subsequent stages will follow the same overall pattern, resulting in each station being touched several times over the next year. Swift bus rapid transit provides quick, rail-like service, with fares paid at the station and passengers getting on and off the bus in about 10 seconds. 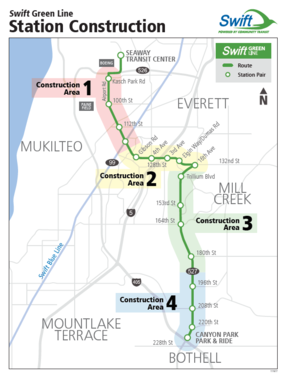 When the Swift Green Line connects with the existing Swift Blue Line at Highway 99 & Airport Road, it will establish Snohomish County’s first high-capacity transit network. The network will eventually include more Swift lines and Link light rail. Swift Green Line will begin service in early 2019. © 2017 Swift Network News is published weekly by Community Transit.